A weekly menu is the best thing since sliced bread. Or cream puffs. 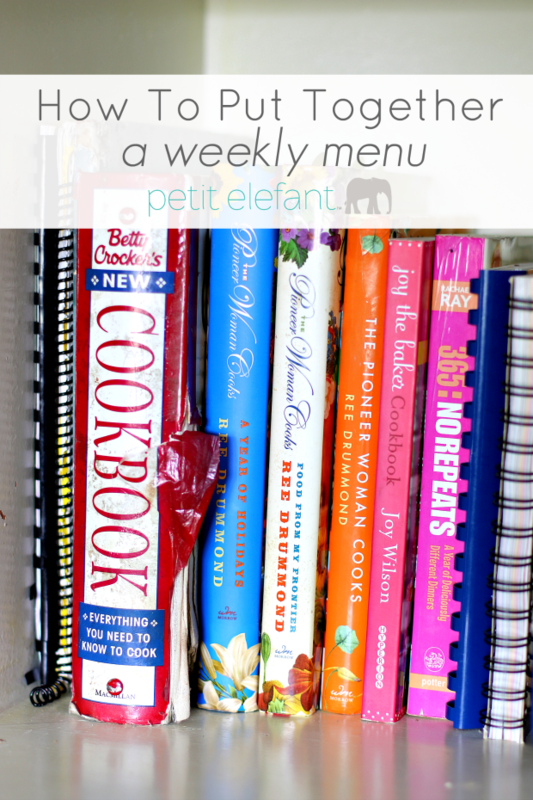 Actually, a weekly menu is the best thing since chocolate. Well, maybe not chocolate, that’s crazy talk, but let me put it this way: my weekly menu saves my life. 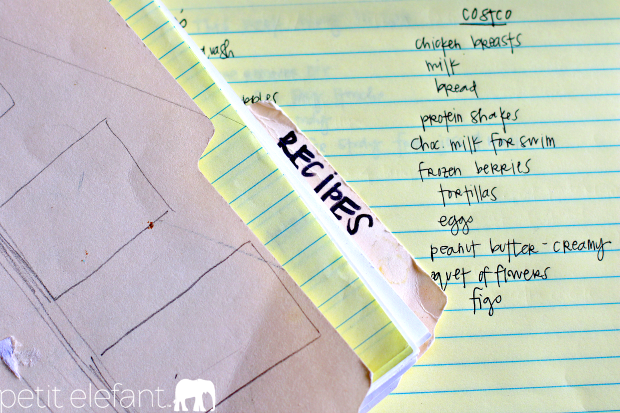 I’ve done every kind of meal planning there is: flying-by-the-seat-of-my-pants planning, organized-but-not-written-down planning, no-planning-of-any-kind, eating-out-instead-of-planning, and most recently, writing-it-all-down-and-being-extra-organized. The best out of all the meal planning options? Writing it all down and being extra organized. For about the last year and a half I’ve been vigilant about putting together meal plans and grocery lists every week, and it has saved my bacon. (see what I did there?) Even if we end up being in a hurry and eating out here and there, having it all organized ahead of time means even with the occasional treat out, most weeks we sit down at least 5 nights for a legit family meal. Since I’ve figured out my system, my life feels so much less stressed. I know what we’re eating for dinner by 7:30 AM every day, which means if something needs to go in the crock pot all day, or some chicken needs to spend the day thawing in the sink, I have plenty of time to get it done. 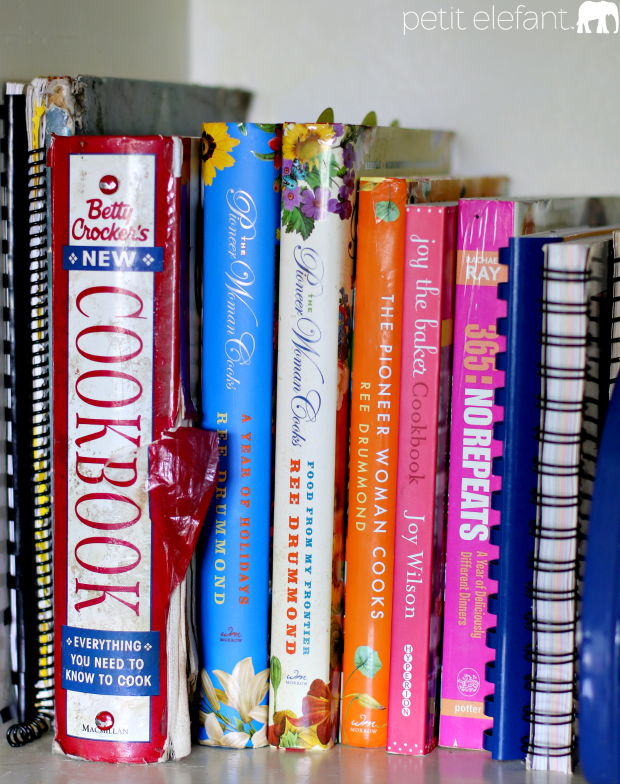 Once a week, usually on Sunday nights but sometimes on Monday mornings, I sit down with a handful of my cookbooks and laptop and browse recipes. We eat anything from old family recipes to casseroles from church cookbooks to eats from The Pioneer Woman and Rachael Ray. But my most recent method is my favorite yet. 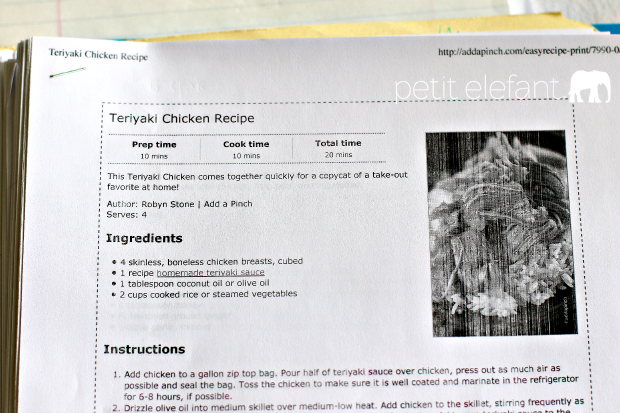 I browse food blogs, and when I find something that looks good, I print it out. 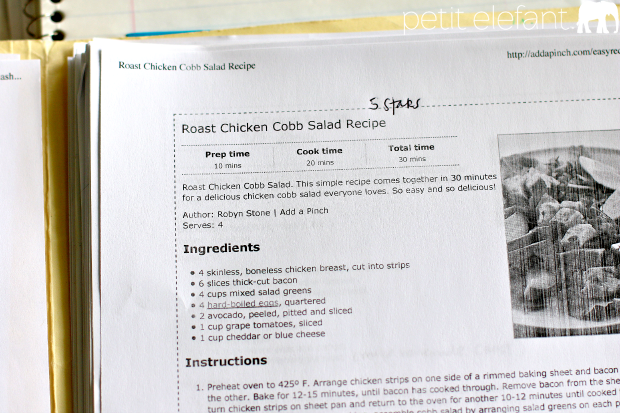 I’ve been gathering recipes printed from food blogs in a folder along with my cookbooks for the last handful of years, and am working on building a master recipe book. Food blogs are my favorite. Some of my most trusty sources for great recipes that turn out almost all the time and are practical, universally loved recipes are: This Week For Dinner, Pioneer Woman, Add A Pinch, and She Wears Many Hats. 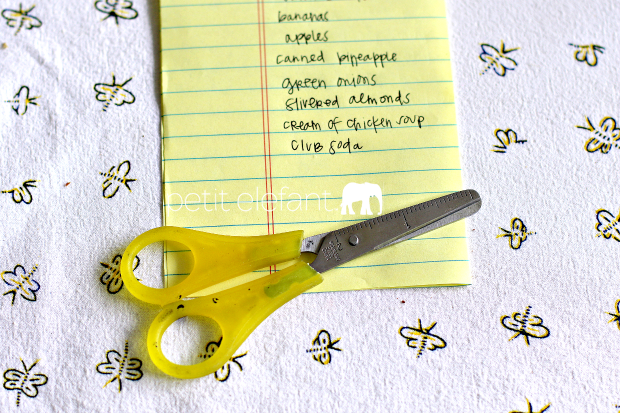 Once I’ve gathered my recipes I grab the yellow notebook I keep next to my desk and I make a menu at the bottom of the page. Then in two columns on the top left and top right of the page, one for each store I shop, (my local grocery store Macey’s and Coscto, a national big box store). I write down the ingredients I need to buy for each recipe that week at each store. I buy specific things at each: milk, bread, meat, etc at Costco, smaller veggies and single cans of food at Macey’s. I grocery shop enough that I know what’s cheaper where, and when each store has different things on sale. I save a lot of money doing it this way. Luckily both stores are next door to each other so it doesn’t take extra time. Most weeks I can get all my shopping done at both stores and fill up the car with fuel at Costco in an hour or less. 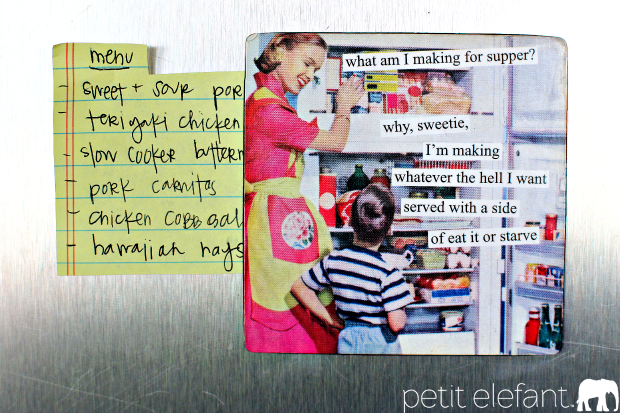 Then I fold the piece of paper in half, cut off the bottom with the menu, and stick it on the fridge with my favorite magnet. 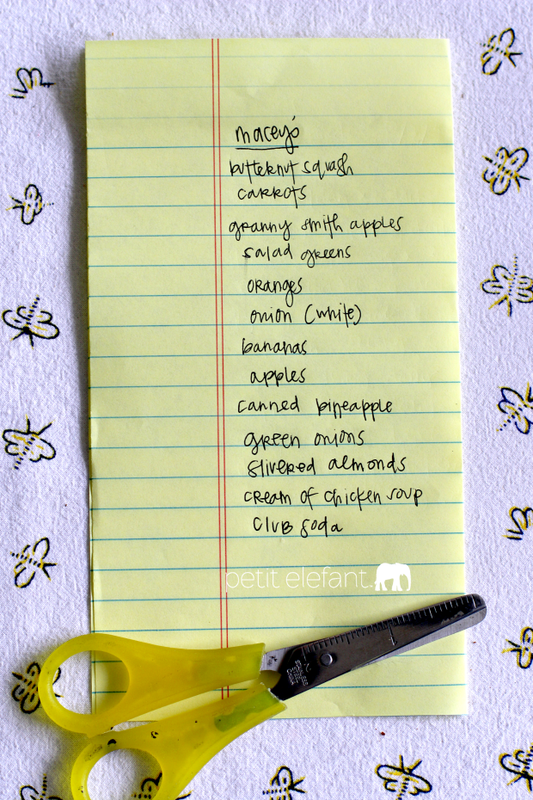 I keep the grocery list folded in half so when I go grocery shopping I keep the list for each store separate. It just keeps it simplified for me. 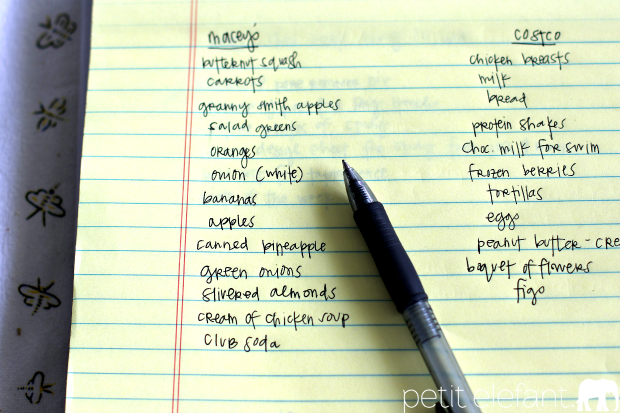 I don’t list out what we’ll eat each night because our schedule can vary so much from one day to the next, so I just plan for and buy ingredients for 5-6 meals and then move things around as the schedule changes during the week. Every morning I look at the menu and decide what we’ll eat that night depending on how busy the day will be. Then after dinner, when we’ve tried a new recipe, I ask everyone how they liked the food on a scale of 0-5. Most of the time it’s all 5’s (whew) and I mark it the general consensus number at the top of the recipe for future reference. It helps a lot. And that’s it! 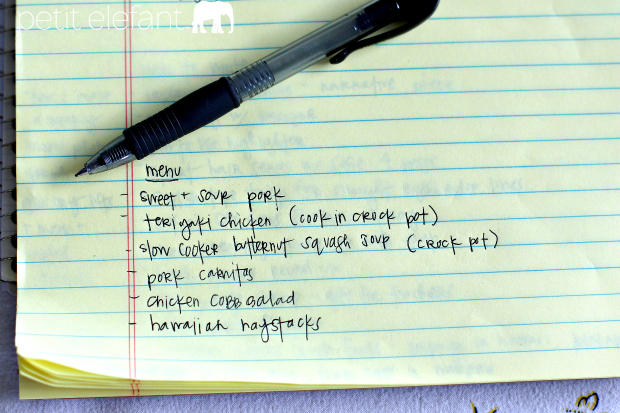 This kind of meal planning is super simple and uncomplicated and has made it possible for us to sit down as a family for a proper dinner every night. We save a lot on food because we’re eating out less, and we’re spending serious quality time decompressing together as a family at the end of each day, which is so important to me. Good luck making your own weekly menu! If you’re a smartphone kinda girl, I use an app that takes it a step further. 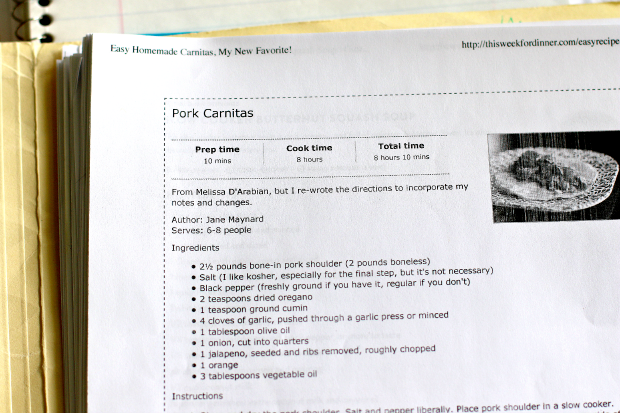 All my recipes are on there and I can plan my meals and just click on what ingredients I need from the recipes. They go straight to my shopping list, also in-app. 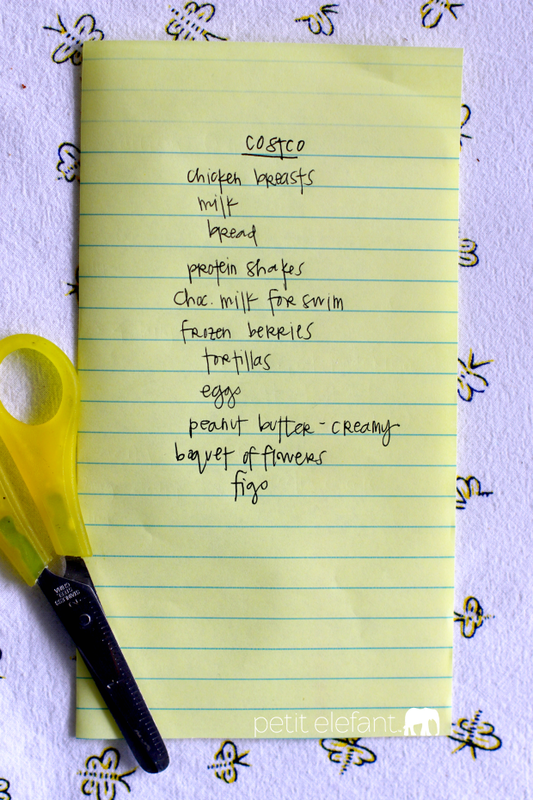 I do wish there was an option for multiple lists (because I split my shopping between Costco and Smith’s). There is an initial time investment to import your recipes, but it’s totally worth it. The app is called Paprika. I have it on iOS, not sure which other platforms have it. It’s amazing. And not free. But worth it.